Are you biggest Filmy fan ? Have you ever had a question in your mind to be a Bollywood star ? Contact us on mobile no. +919022034923 / +917666866256 or MAIL US AT: bollywoodpostersstudio@gmail.com Bollywood posters studio online store gives you the opportunity to make your debut with your very own Bollywood movie. Make your very own hand made customized Bollywood poster and create your own still on oil canvas by adding your face on your favourite movie you can give your own name to the movie be the director and star of your Bollywood poster. Poster will be 100% hand made no photoshop created with the highly experienced team of custom made Bollywood posters artist , Mumbai,India. Artist of custom Bollywood movie posters give you the true vintage look with vibrants colours. Perfect personalized and customized gift for your family, friends, relatives and colleagues. 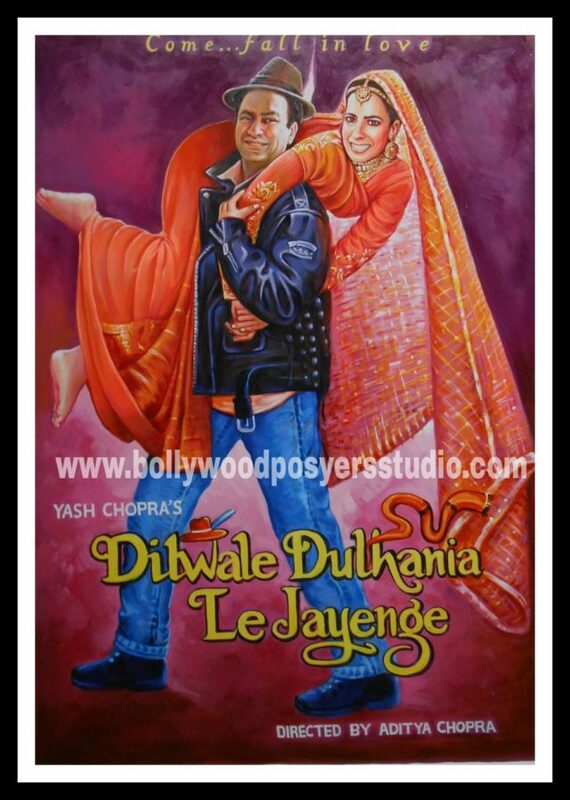 Create vow moment with these hand made customized Bollywood posters. Make moment more special by gifting your true feelings wrapped in hand made customized Bollywood posters. Custom made posters can also be used as wedding shower invitation cards, perfect hand made posters for bridal shower. These hand made customized posters will be successful gift. Absolute way to make your daughters/ sons wedding heart touching. May the words won't express your feelings what you want to convey but these hand made custom Bollywood posters will surely pass your message to your loved ones. Our custom Bollywood poster artist are authentic and genuine gives 100% satisfaction to their clients. Personalized custom Bollywood movie poster can also be use for Bollywood themed party, Bollywood themed photography, Bollywood themed wedding backdrops, Bollywood themed birthday anniversaries, Bollywood themed sangeet ceremony, Bollywood themed Bridal showers cards etc…. Make your wedding lavish with your own custom Bollywood posters and suprised your relatives and visitors.